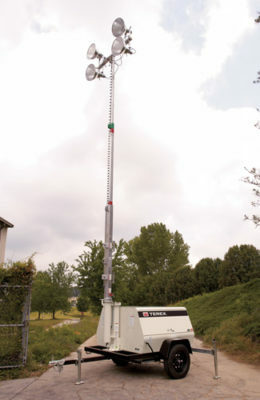 Light Tower - Aviation Ground Equipment Corp.
With its 359° rotation, optional 20 kW generator and ability to light up the job-site from its extended 30 ft (9.1 m) floodlight tower, the Terex® AL™5 light tower is designed to give you ultimate work-site flexibility. 4 X 1000 W metal halide lights with Kubota engine and 8kW generator. Option for up to 20kW generator with plenty of extra power to run all of your tools. Durable 30 ft (9.18 m) fully galvanized mast with single self-braking winch design, 359 degree rotation, and retractable mast cable gives excellent illumination at long distances. Standard engine protection includes high water temperature and low oil auto shutdowns. Quick disconnect lights and ballasts allow for easy troubleshooting, service, and repair. Internal storage system for light fixtures provides safekeeping and protection during transport. Heavy duty mast, chassis, and 3,500 lbs (1,558 kg) rated axle to handle rough road towing.